5 Reasons Why To Use Perfume. Love luxurious perfume? You may want to know why a person should wear perfume as often as they like! Wearing perfume during the Middle Ages was done to get rid of the stench. During those times, taking a bath was believed to open the pores and that was a main factor of the spread of diseases. King Louis XIV of France, the Sun King, was advised by his physicians not to bathe. It is said that he only took a bath twice in his lifetime. It may sound a bit bizarre but apparently, this advice seemingly had worked in his favor as King Louis XIV holds the record for the longest-reigning king in European history, having reigned for 72 years and 110 days. Yet, it is a fact that one of the reasons why the Black Death spread to kill thousand of people during this time, aside from the fleas that carried it, was the lack of hygiene because of this belief. The main reason why people do use perfume is to smell good. Not taking a bath has been proved to be unsanitary but dousing perfume does cover up any bad odor. It's no wonder why the perfume industry has prospered over the centuries. Perfumed scents are everywhere - from soaps to air fresheners. 1. To become more attractive. Seductive, alluring, or nice and pleasant to have near. Someone who has on great perfume is a pleasure to have around, to stay close to, and to hug. 2. To define oneself. A lifestyle or a fashion statement is enhanced with perfume. The musk smell makes one think of the outdoors while the flowery scent of roses and lavender is romantic. There are sporty perfumes and the ones that are fruity. Pick the perfume according to the style that you want to be identified with for a few hours, few days, or to make your scent unforgettable. 3. To smell different. One example of when you need perfume to smell different is if you share the same bath soap and shampoo with your sister. And, if you are in a group, then you would stand out because of wearing genuine perfume. 4. To uplift the spirits. Dabbing on perfume is a way to feel better. The essential oils, no matter what scent it is, will surely bring aromatherapy benefits to the one who wears it. 5. As the finishing touch. All dressed to go out? Ready to step into the event? Place on perfume as the final step to being perfectly dressed. Note that even every day, wearing casual outfits or lounging around at home, using perfume makes the delightful difference. Some people believe that genuine perfume is a luxury but that is not the case. A spray or two, a dab here and there, will have a delightful scent that will last for hours. Remember the small tube samples? The perfume inside won't run dry right away even if it is used daily. With free shipping for orders over $75 and a free sample with every purchase, choose among the 10,000 authentic brand name perfumes at this online perfume store which are sold with up to 80 percent discount off the retail price. 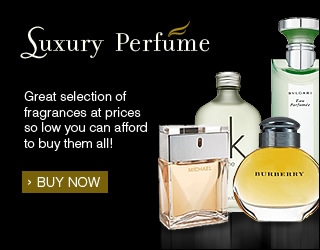 Luxury Perfume has been selling perfumes for over 25 years. This company sells retail and wholesale perfume and ships both locally and internationally. Now, with this Luxury Perfume review, you have another reason to buy perfume as the prices at this online perfume store is highly affordable. Have you used the Luxury Perfume? Share your review!